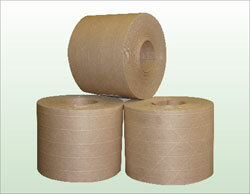 It is an economy grade 3-way fiberglass reinforced water activated paper tape, that comes with natural and white color. This tape, also known as gummed tape, is cost effective and tamper evident sealing solution. It is used primarily in the sealing of corrugated boxes and is particularly effective with the rising content of recycled material in corrugated board. It is recommend to use this tape to seal light to average weight cartons made of virgin or recycled fibers, when two tape strips are needed (top and bottom).